Up for sale we have a 1964 ½ Ford Mustang Convertible. This is a true 1964 ½ Mustang that is a D Code car. It was restored in 2006 and was kept in a climate control building. It's covered in the Wimbledon White which is the factory color for it and it's accented by the White Convertible top. The paint shows very well with a slick finish and a deep shine. At the time of the restoration they did a great job on the body, down the sides it's arrow straight with good fit of the panels. New bumpers were installed as well as other new chrome. To finish off the exterior it's sitting on a set of Chrome Styled Steel wheels with white wall tires. On the inside it's done in black that is also the factory color for it. New seat covers were installed along with the door panels. It has the correct bucket seats and console along with the correct four speed shifter. It retains the stock AM radio and the A/C unit is the Ford Under dash. This is a Power Top car with the Black top boot to match the interior. Under the hood it's powered by a 289 V8 Four Barrel. It looks as it would back in '65 with the engine being painted along with stock valve covers and breather. The trans is a Four Speed that's mated to the stock style rear end. The firewall and inner fenders are all painted correct with factory markings. The exhaust flows through stock manifolds with dual exhaust. 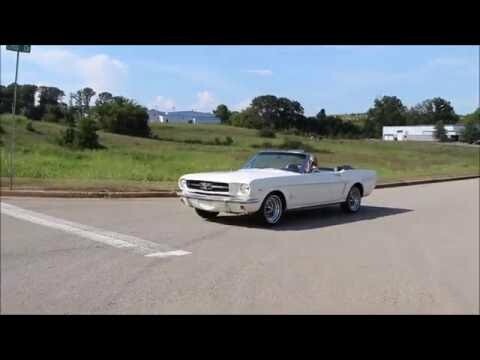 This 'Stang has Power Steering and Factory A/C. When you look under it you are sure to appreciate the detail with red oxide floors that look great!